[Episcopal News Service] The food ministry at Trinity Episcopal Church in Charlottesville, Virginia, starts in the church’s garden. Volunteers till the soil. They weed and water the raised beds. They harvest the produce when it’s ready, their work sessions filled with fellowship and concluding in prayer. The ministry, called Bread & Roses, then brings that fresh produce into the church’s commercially certified kitchen, where it becomes a learning tool in cooking classes that teach lessons in nutrition and healthy cooking techniques. As a bonus, Bread & Roses, led by program coordinator Maria Niechwiadowicz, is now standing on its own financial legs after getting an early boost from Mission Enterprise Zone and United Thank Offering, or UTO, grants from the Episcopal Church, and more recently, a Jubilee Grant. Bread & Roses’ sustainability relies partly on opening up the kitchen to low-cost rentals by entrepreneurs with upstart food businesses. The Unite the Right rally on Aug. 12 drew a mix of neo-Nazis, Ku Klux Klan members and other hate groups in defense of Charlottesville’s statue of Confederate Gen. Robert E. Lee, which had been slated for removal. Violence broke out, one counterprotester was killed and dozens of people were wounded despite the fact that the city shut down the rally at the last minute as tensions escalated. Episcopalians were among the faith-based groups who joined together in nonviolent marches against the hate groups, and Presiding Bishop Michael Curry made a pastoral visit to the city in September. Bread & Roses wasn’t originally intended to support racial reconciliation. But after the clashes last year drew national attention to Charlottesville, Niechwiadowicz said it became clear that the fight for social justice has many fronts and is strengthened by people of faith. “One thing that has really stood out to me, particularly in the events of Charlottesville, there’s a lot of work put into advocacy movements, whether that be racial justice or food equity, but it’s all connected,” she said. That interconnection of social justice issues has guided Bread & Roses from the start. It wasn’t created to be another soup kitchen or food pantry; feeding the hungry isn’t as central to its mission as food education. “We wanted to do something that would address more systemic issues related to food and food justice,” said the Rev. Cass Bailey, vicar of Trinity Episcopal Church. A UTO grant of $17,000 in 2014 helped the church to upgrade its kitchen, part of the church’s $115,000 capital campaign. The Mission Enterprise Zone grants helped pay the part-time program coordinator’s salary through 2017. After an initial $20,000 MEZ grant, Bread & Roses applied for and received additional grants of $10,000 to maintain momentum as the ministry began to flourish. And this year, the ministry received a $3,000 grant from Jubilee Ministries, which supports anti-poverty initiatives. He also noted that Niechwiadowicz has successfully carried the program forward after picking up where the program’s previous coordinators left off. As with many of the ministries that receive MEZ grants, the vision transcends the individual. “They have incredible stories of engaging their community and making a difference in people’s lives,” Brackett said. And beyond the financial support, ministries like Bread & Roses benefit from mentorship provided by Brackett’s team. After receiving the first MEZ grant, Bailey attended a conference with other church planters and new ministry leaders, where he learned about the wide variety of programs that were funded and also saw plenty of similarities. “We were all asking similar questions about how to get this idea that we had off the ground and what kind of issues are common among us in doing a startup ministry,” Bailey said. He also participated in monthly phone conferences that allowed the grant recipients to share their experiences and learn from each other. “We just could not have done it without the support of the MEZ grant,” he said. Niechwiadowicz has been coordinator since 2016, and this year, her salary is funded directly through the ministry’s $43,000 budget. About a third of its income comes from kitchen rentals, another third from local grants and the rest from Trinity. Bailey said the congregation measures the success of Bread & Roses by how many programs it provides, and by that measure it is going strong. The original mission hasn’t changed, but it has evolved in how it partners and collaborates with organizations in the community to expand those programs. Niechwiadowicz works about 20 hours a week as program coordinator – she also is Trinity’s part-time administrator – and teaches some of the cooking classes held in the Bread & Roses kitchen through a partnership with Sentara Martha Jefferson Hospital. Every other month, the hospital refers some of its patients to Niechwiadowicz, usually because they are trying to lose weight or lower their blood pressure. 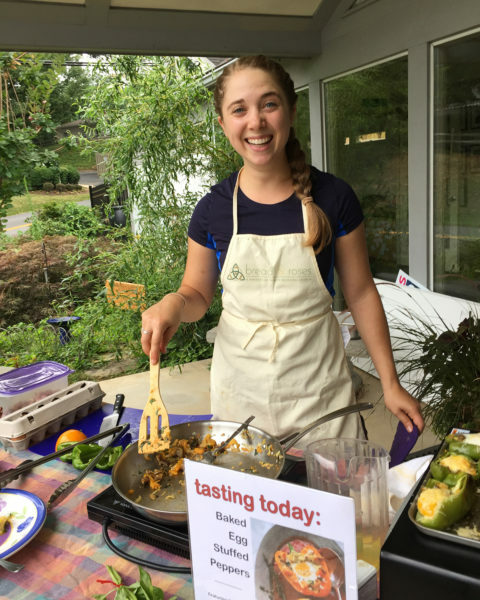 During those months, Niechwiadowicz teaches one morning class and one evening class one day a week for three weeks with an emphasis on quick, healthy meals. Class sizes range from two to a dozen students. Other classes that Bread & Roses hosts are more spontaneous, Niechwiadowicz said, such as the classes in Afghan cooking that are being led by an Afghan refugee who lives in Charlottesville. Bread & Roses has other partnerships with community organizations to offer additional classes, and the church has committed to giving half of the food grown in its garden to a free market set up at a public housing complex in the city. Such partnerships “bolster the relationship building that happens through sharing food together. 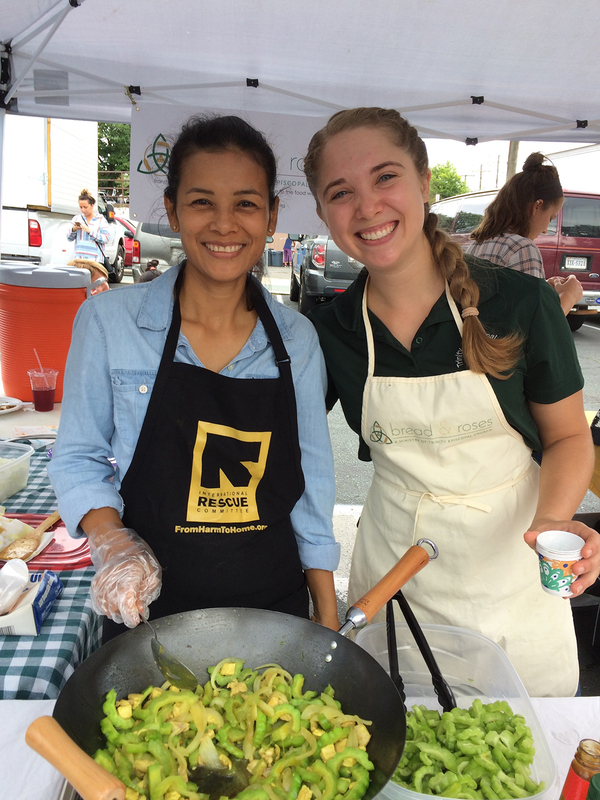 That’s one of the things that Bread & Roses has been really great at,” said Brooke Ray, senior manager of the food and agriculture programs at the Charlottesville branch of the International Rescue Committee, or IRC. The IRC is the federally contracted agency that oversees resettlement of refugees in the Charlottesville area, and much of its work with Bread & Roses has focused on educating newly arrived refugees about healthy options in the American food system. The refugees also can grow vegetables native to their homelands at the urban farm and community gardens run by the IRC, and that has provided additional opportunities for educational partnerships. 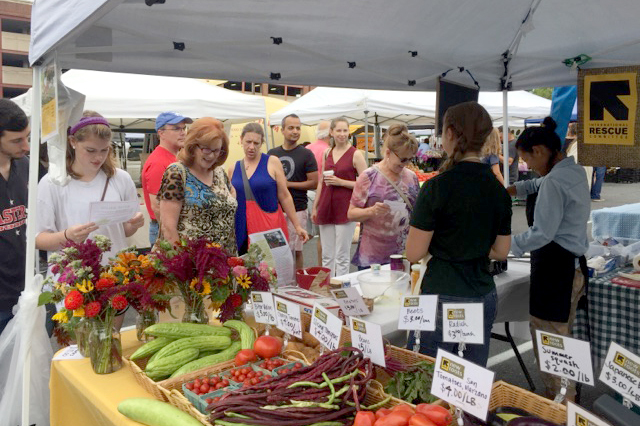 Last year, Niechwiadowicz started organizing cooking demonstrations once a month at a city farmers market featuring some of the produce harvested by IRC’s clients. The refugee gardeners were invited to help lead the demonstrations, which were a big hit among the farmers market customers, Ray said. Trinity is doubling its own garden space this year. Volunteers from the congregation and the community tend to the garden beds weekly from May to October, giving them a hands-on role in the success of Bread & Roses. 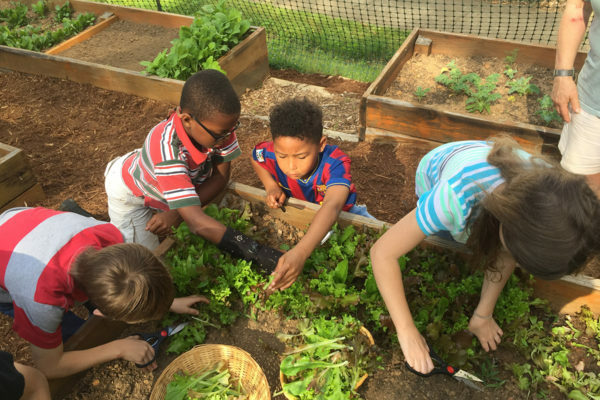 The garden also has played a role in other ministries at the church, such as the Christian formation program, which incorporates spring garden planting into its curriculum for the younger members of the congregation. Bread & Roses “is an outreach program, but it’s connecting the members of Trinity Church to the broader community and vice versa,” Niechwiadowicz said. The church underscored that connection in February by hosting a conference, “Faith-Rooted,” where participants discussed theology of food equity and the social justice work of faith communities. For Niechwiadowicz, living a life of Christ means reaching out to people on the margins of society and listening to their needs, and she thinks such spirituality deepens the work of ministries like Bread & Roses. As worthwhile as this effort is it is a far piece away from Jesus’ direction in the Great Commission to “go…make disciples…teach…baptize”. The 1st century wasn’t the Stone Age. People then were hungry, mistreated, divided by politics, and subjected to violent protests just as much as anyone today. Yet, Jesus placed the focus on the heart and personal transformation rather than societal protest and restructuring. Times haven’t really changed. The answer still remains for Christians to become ignited to make disciples, teach about Jesus, and baptize. The Great Commission is much harder but remains. This is fantastic! About 20 years ago, I was a UVA student. Trinity Episcopal was the first Episcopal parish I ever attended. It is good to read that they are doing such good work.